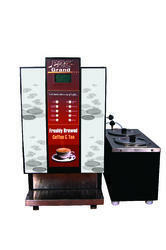 Pioneers in the industry, we offer automatic coffee vending machine from India. Automatic coffee vending machine have become a part and parcel of any corporate set-up because of their versatility, convenience and cost-effectiveness. Within seconds, a hot, hygienically prepared beverage is ready for the pleasure of clients and employees alike! Digital counters and programming options give the touch of ergonomic modernity while hygienic dispensing and easy refilling options give a new dimension to vending. Ability to dispense high volumes at low cost are some of the key factors that has helped us stay unique! We have been actively embraced by many corporates and have become a favorite name in the vending industry. Looking for Coffee Vending Machine ?